Kenya is a coffee origin that constantly impresses us in its stellar cup profiles and continues to challenge us on the ground. We cup through hundreds of coffees throughout the season to curate a diverse and delicious portfolio. The coffees we selectively buy are from the Cooperative Societies. 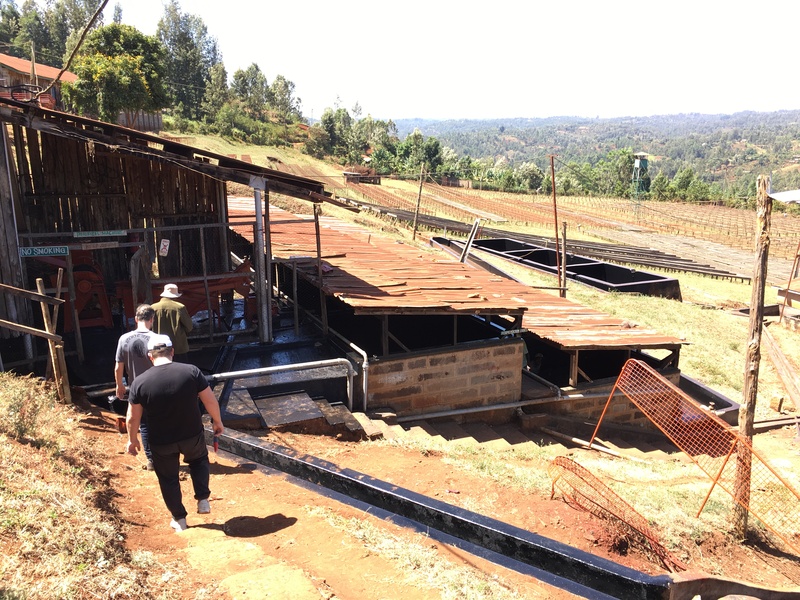 The Societies can have one or several washing stations or “factories” that process the coffee. These factories will purchase cherries from the surrounding smallholders, or individual producers who own small scale farms (about a few hundred trees). After they are purchased the cherries are mixed together towards one daily lot - typically made up of hundreds of different small scale farmers cherries. These factories, even the most well known ones, will have a relatively wide quality range. This means that you have to selectively cup through their outturns to find the best performing coffees every year. You have to be there to cup several times throughout the season, as the parchment deliveries are coming in over a longer period of time. The majority of the coffees we choose have been coming from Factories (washing stations) under the Cooperative Societies in Nyeri and Kirinyaga. We have a portfolio of returning producers and factories that we have worked with over many years. Our goal is always to maintain these relationships. Besides this our general buying strategy in Kenya is based on finding extraordinary coffees performing extremely well on the cupping table. And of course they have to be traceable! But that’s normally not an issue in Kenya. Whether we buy it direct from the Cooperatives/Farms or through the auction, you can determine where it's coming from. But it's also important to buy it from a trustworthy supplier so that you know the premiums are going back to the producers. Many of the Cooperatives place their pride and efforts in good returns to the farmers. It’s also a way to attract the framers to deliver their coffees in the future. We are always paying a price above the Fairtrade farmgate prices. We strive to negotiate and buy coffee direct from the Cooperatives outside the coffee auction. These prices are higher than in the auction. In the cases where exporters have taken position in coffees on our behalf we have traceability on pricing back to the producers. All coffees are traceable back to the wet mill (Factory) as a minimum. Our coffee buyers visit Kenya up to four times a year. Our selection is based on a scoring system, where the general cut of is at a minimum of 87 points. Kenya lies at longitude 34 – 42 degrees and latitudes 5 degrees and covers an area of 580 thousand square kilometers. There are about 43 million inhabitants. The two main coffee growing areas are in the surroundings of Mt. Kenya in Central Kenya as well the west all the way towards Mt. Elgon at the border of Uganda. Kenya can produce up to 65,000 tons of green coffee and varies from year to year. The last few years it’s been around 45,000 tons. Kenya mainly produces fully washed coffees, and is considered by many as the world’s number one quality producer. There are more than 700 thousand coffee farmers (smallholders) representing about 55% of the production. The rest are mostly Estates. There are about 3000 small estates with less than 20 hectares, 300 larger ones and about 1,100 cooperative wet mills. Coffee exports counts for about 10% of Kenya’s income. Coffee came to Nairobi in 1897 and was well cultivated in the next ten years. Around 1910 the colonists living outside Nairobi started to plant trees in areas like Kiambu and Thika. By 1920 coffee became Kenya’s main export crop. During the 1930s the coffee industry went through major changes as it went from being a colonial experiment to a major industry. They started to experiment with different marketing strategies and cooperative systems. Some of the planters started the Thika planters Cooperative Union that later became the Kenya Planters Cooperative Union. The KPCU became dominant voice of the Kenyan coffee planters. They have played a major role as marketing agents and dry millers up to now, but have had some challenges in recent years, and in short went out of business a couple of years ago. In 1932 the Coffee board of Kenya was established. They established the coffee auction in 1934. In the late 1940s they established a nationwide grading system and introduced the mechanical huller to remove the parchment. In 1934 the colonial government allowed indigenous people to plant coffees under strict regulations, but it didn’t work well. From 1946 they encouraged Kenyans to start planting cash crops. After 1950 the smallholder sector picked up. After a while it dominated the KPCU. They started to build wetmills from the 1960s. In 1978 the smallholder sector surpassed the large estates in terms of production, and still accounts for more than 50% of the total production. Our primary focus is building a relationship with the Cooperative Societies. This means we aim to do business with the same producers year after year. But of course, when a truly exceptional coffee stands out on the table, we may purchase from a producer or washing station whom we never worked with before. In general our coffees are from smallholder farmers that deliver coffees to washing stations (Factories) under different Cooperative Societies in Central Kenya. That said, we are generally open to buy and establish relationships with any type of producers, whether they are single farmers on a small or large scale, that’s producing the good stuff in any coffee growing region. Our strategy is simple; We cup extensively throughout the harvest. We will see to over hundreds of coffees and follow their journey throughout the year. In this manner we get to know these coffees up until their prime. Our toolbelt of cup profiles, key regions, and steady relationships is the result of hard work over many years. Our favorite regions and producers that we feel are performing at a world class level include regions like Nyeri, Kirinyaga and others in Central Kenya. During a cupping trip at origin we spend most of our time in labs cupping loads of samples. Throughout this period, exporters will also be cupping huge amounts daily both for direct purchases from the Cooperatives and for lots sold at the auction. We cup with also having in mind the potential in a cup. This means even if we prefer direct purchases we also keep an open mind to any coffee that showcases great quality. Once we find a coffee that meets our standards and is available for direct purchase we then negotiate prices for the cooperatives through the marketing agent and exporter. As for auction lots, we can also arrange purchase for that specific coffee through the exporter. Whenever we have found a coffee that is not yet offered at the auction and want to commit, we will have the marketing agent negotiate the price directly with the producers (in our case the Cooperative Society as we normally buy from the smallholders cooperatives). If you buy coffees direct through the second window, the producers expect to get prices above the average auction prices at present time. As soon as we have agreed on the price the coffee will be moved to the warehouse in Nairobi to get handpicked and packaged in Grain Pro or Vacuum according to our specifications. The coffees will sit in the warehouse until we have a confirmed shipment leaving Mombasa. The good thing with the system in Kenya is that everything is more or less separated into small lots and different grades. By tradition and through the auction system each coffees has been evaluated separately and get a value and individual price based on the cup quality and attributes. This gives the producers great incentives to focus on quality control, as it will normally pay off. The system is transparent; Everybody knows what’s going back to the society after cost of milling and marketing is deducted. There have been issues with payment from some marketing agents to the Societies, and from the Societies back to the farmers, but we strive to work with Cooperative Societies that are able to document what’s going back to the producers. In fact many of the more serious Societies and factories are competing, getting cherries in from the same areas, and are putting effort and pride in giving the best payback to their farmers. Some of the Coops we work with have been able to pay up to 90% back to the farmers. It's important for us to try to get a good sense of the management and quality control at the Cooperative level. Even if we are generally buying based on cupping profile we still want, if possible, as many returning high performance producers as possible. Visiting the the Cooperatives will give us great insight in the management of the facility, which ultimately tells us about their consistency. Being present also allows the producers to feel recognized and motivated to perform better. Specific feedback and projects can be implemented if they are willing and if it is followed up by a third party organization and marketing agent like CMS or Tropical that perform farmer training programs, etc. It’s important to gather information of the producers production scale, their way of processing coffees, to what extent they do lot separation and if they have solid systems put into place for quality control. It’s also important to have an idea of what percentage they are able to pay back growers after the coffees are sold. We find that this percentage should be around 85%. It’s important to have the same, high-scoring coffees return year after year. This builds a brand for that product and therefore secures them a spot in the market. It helps our clients as well to have a unique product in their arsenal that is consistent. When we arrive to new areas, it’s imperative to map out the general cultivars the farmers are mostly using and the overall altitudes. When we are searching for new cooperatives we also start noting the: altitude of the factories, how strong the management is, how well they performed in the auction in the past years, and if they have certification programs and such that forces them to log and have systems for a sustainable production. Coffee plants were first brought into Tanzania by the French missionaries from Bourbon Island. At the same time Scottish missionaries were active in Kenya and were experimenting with Mocha seedlings from Ethiopia. Together the two groups introduced the two strains Mocha and Bourbon. It supposedly hybridized in the Kilimanjaro area into a new varietal known as French Mission. They started early in Kenya to experiment with varietals. Around 1910 they experimented with the Tanzanian (Tanganyika) varietals and mixed them with varietals from Mysore in India. This hybrid is now known as Kent. In 1934 they started to develop new varieties in the Scot Laboratories. They discovered a variety in the Mondul area in Tanzania that had good resistance against drought and pests. They also gathered trees of the original French Mission and other varietals that seemed to perform well. About 42 different trees of the French Mission and different Mocha varieties were selected in the 1930s based on their yield, quality and resistance to pests, drought and diseases. The new varietals from the Scot Laboratories was prefixed as SL. They started with SL1 created from the “Kenya Selected” and developed a lot of different SL’s continued with SL2 , 3, 4 and so on, all created from different varietals based on French Mission, Bourbon and Mocha (Typica). Finally they ended up with the SL 28 and SL 34 that are still widely used. SL 28 was selected from a single tree from a Tanzanian drought resistance variety, and have some Ethiopian influence as well as traits from a tree from Sudan’s Boma plateau. It has a broad copper tip leaf, bold beans, but are pretty low yielding. It’s known for delicate and complex flavor attributes. SL 34 came from a single selection of French Mission at an Estate in Nairobi. It’s similar to the old “Kenya Selected” in appearance. It has been highly appreciated for its high yield and shows good resistance to droughts. K7, another well-known variety was also selected from the French Mission, and are known for great immunity towards diseases. Still, not as much appreciated for cup quality as the SL’s. Ruiru 11 was created in the 1980’s. The goal was to create a high yield plant resistant to leaf rust and CBD (coffee berry disease). They mixed “Hibrido de Timor” (a Robusta/Arabica hybrid) with “Rume Sudan” from the Boma plateau as well as with SL 28 and SL 34 for improved cup quality. Blue Mountain was brought in from Jamaica and planted in western Kenya around 1913. It hasn’t been too successful in Kenya, but you can still find it in the Western parts. Batian is a new high yielding disease resistant variety that was released by the Coffee Research Foundation in Kenya in 2010. It’s supposed to improve cup qualities compared to Ruiru 11, and should be more equal to the SL 28. It’s back crossed from SL 28 and SL 34 and include SL4, N39, N30, Hibrido de Timor, Rume Sudan, and K7. One of the largest challenges the coffee plant faces is the fungus that causes CBD or “Coffee Berry Disease.”. The fungus lives in the bark of the coffee tree and produces spores which attack the coffee cherries. The coffee cherries become dark, almost black in color and if it spreads at a farm or estate it can be devastating. It can be treated with copper formulations or organic fungicides. Still, this is too expensive for most farmers. Another other challenge is leaf rust. It creates red/brown spots on the leaves. 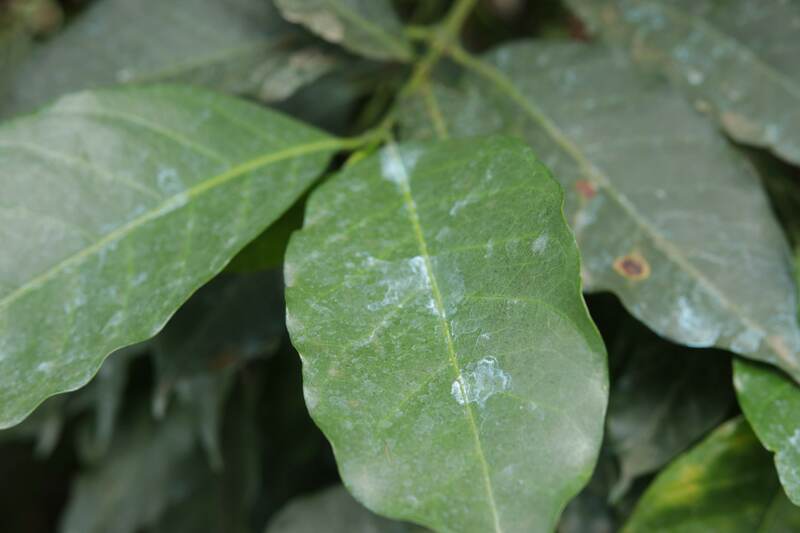 Coffee leaf rust is spread by wind and rain from spores from lesions on the underside of the plant. It can also be treated with expensive copper-based fungicides. The coffee sector is divided into smallholder cooperative societies, small estates with less than 20 hectares, and large estates. Cooperative societies and their wet mills represent more than 50% of the Kenyan coffee production. In our opinion, you can find coffees from some of these producers greater than almost anything else in the world. The societies are the umbrella organization for one or several wetmills. Typically you have the Tekangu society that represents the wetmills Tegu, Karogoto and Ngunguru. The wet mills in Kenya are called Factories, e.g. Karogoto Factory. 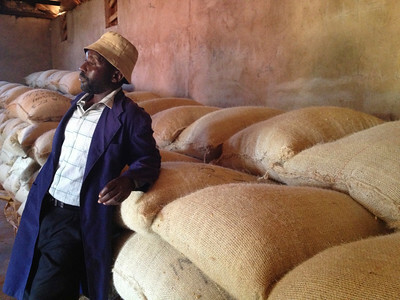 The Tekangu society will monitor the financing and will be the seller of the coffee from the factories. Still the individual wet mills will be responsible for production, management and overhead cost. The farmers can choose where they want to deliver their cherries, and if a wet mill does well, and is able to give a good second payment to the farmers they will attract more cherry suppliers. A typical wet mill can have about 1000 farmers delivering cherries. They give a small advance payment at delivery. The better and well-managed wet mills are able to give more than 85% of the sales price back to the farmers. That’s after cost of milling and marketing is deducted. 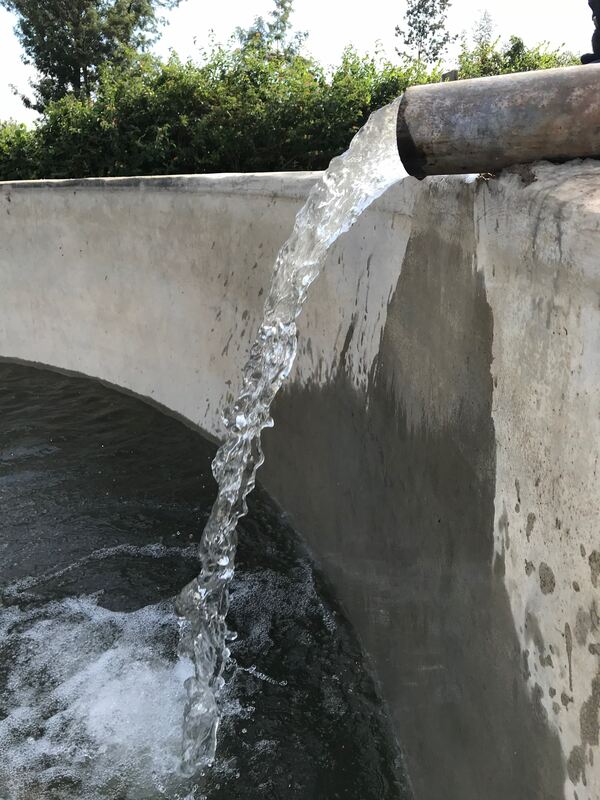 Most wet mills use traditional disc pulpers before dry fermentation, washing in channels, soaking in clean water, drying at raised tables and conditioning in bins at the warehouse. Small Estates are located all over but are more represented in certain areas (for instance, they are more common in Kirinyaga than Nyeri). They can have amazing coffees, but as they are smaller in terms of production they often blend coffees randomly according to what they have to make a full consignment. This can in some cases be hit and miss. They normally process their coffees with small and modified pulpers of various quality. Normally they follow the same steps with dry fermentation, soaking and drying, but it can be more random according to their capacity when the cherries comes in. The larger estates are mainly located in the outskirts of Nairobi. They do dense planting, high maintenance plant treatment and irrigation. They are able to produce up to 1,5 kg of greens pr tree, about three times of what smallholders produce on the average. Many of them outsource the management to professional providers of management services. The coffees are pulped at traditional disc pulpers, dry fermented, washed and soaked, and dried on raised tables before conditioned in bins constructed by wood and wire mesh. You can find good coffees among the products from the Estates, but in general they are in our opinion missing the flavor intensity and complexity you can find in other Kenyans. We will use the smallholder and cooperative structure to describe the process, though except from picking and cherry delivery, the process is more or less similar for most producers no matter if it is a cooperative or a large estate. Is done at the wet mills or at collection centers. When the farmers arrive at the place for delivery they would normally have to empty their bags on the floor (on a cover) to sort out unripe, overripe and CBD infected cherries. A supervisor inspects the cherries before they are weighed and the farmers get a small up front payment for the delivery. The delivery from every farmer is registered and they get a receipt for the amount. This will be the base for their right to payment after the coffee is sold. Some farmers are organized in groups or associations to be able to cooperate on investments for soil inputs and necessary equipment for farming. After the coffees are weighed they go into the main cherry hopper above the pulper. Some wet mills have a separate hopper for the low grades such as under and over ripes. When they start the pulper the cherries go by gravity into the machine. They normally use disc pulpers such as old three disc Agaarde or similar brands. As long as you change the discs from time to time they can work perfectly well. It’s also important to adjust the pulper to remove the pulp (fruit) properly without damaging the parchment. The parchment flows from the discs with water allowing the parchment to be separated by density. The densest beans will sink and are pumped straight through a channel to the fermentation tank as P1 (parchment 1), the semi dense will go to a separate fermentation tank as P2. The floaters, P3, are considered as low grades and will normally go straight to the drying tables. After pulping, the coffees are dry fermented (water is drained off) in painted concrete tanks. Normally they are fermented for 18-24 hours. Many factories do intermediate washing every 6 – 8 hours, meaning they add water, stir up the parchment and drain it again. When fermentation is completed and the mucilage is dissolved the parchment gets washed in washing channels and graded again by density. The lighter beans will float off and the remaining dense parchment will normally be soaked in clean water up to 24 hours. After soaking, the coffees are skin dried at hessian mesh mats for skin drying up to one day. This is to quickly get off the moisture at the surface of the parchment. Typically after a day the coffees are moved to the traditional drying tables. The coffee is then normally dried on a surface of jute clothing or shade net on top of the wire mesh. The parchment is constantly moved as they sort out defected parchment and beans. The coffee has to be covered with plastic during the hottest periods of the day, normally between 12pm and 2pm as well as during the night. The drying time varies between 12 and 20 days depending on weather and rainfall. The moisture target is 11-12%. They also have a tradition of intermediate conditioning. Depending on the capacity on the drying tables and the producer’s philosophy, some of them take the parchment into the conditioning bins at what they call the black stage, when the coffees are stabilized at around 16%. They can be conditioned for some weeks before they are placed on the drying tables again to finish of the drying. Even if you can buy coffees directly from the producers these days, bypassing the auction, the system is still based on the same structure as before. A producer normally has an agreement with a marketing agent and a dry mill. Whenever he has a consignment ready he delivers the parchment to the mill. This could typically be 200 bags of parchment, equivalent to about 130 bags of exportable greens. The producer is still the owner of the coffee, the miller will charge a fixed fee for the milling and the marketing agent will have a margin based on percentages from the sales. The coffee will be milled and graded in to bean size and different qualities. The mill and marketing agent normally cooperate and the coffee will then often be cupped, and presented in the auction catalogue by the marketing agent. At this point it can also be marketed and sold directly. The rest is lower grades such as C = below14, TT and T is the low-density beans over and under screen 14. In the mill everything is kept separate for the auction, and it’s a great opportunity to cup through the different grades from the same outturns and consignments. At this point we are able to do extensive cupping at the mill to be able to pick out our coffees before they enter the auction catalogue.